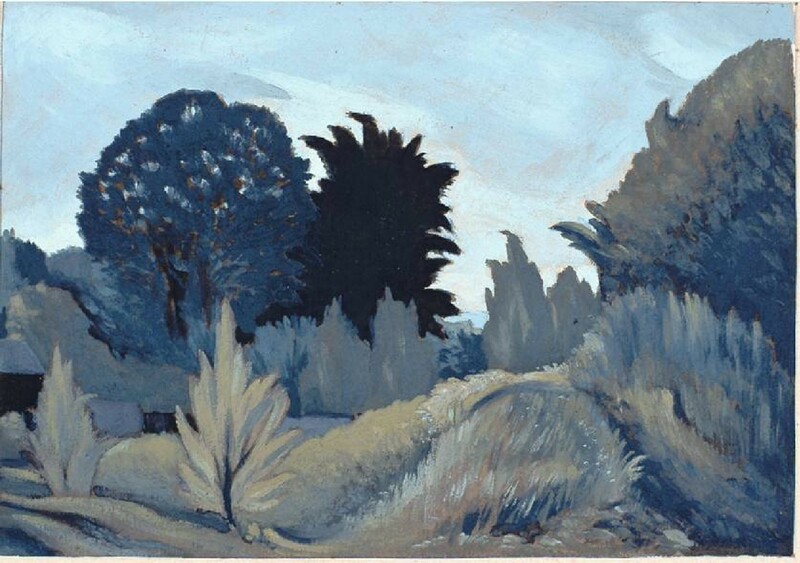 Following the artist’s death at his Surrey home at Tadworth in 1964, his widow and only son initiated an informal family trust for the care and promotion of Maynard Smith’s paintings and drawings. Soon afterwards the artist’s son started to compile a manuscript catalogue of the works themselves. The significance of Maynard Smith’s work was clear from the start, but the extent and range of his output was not immediately apparent. The RMS Trust in its present form was set up in 1995. Initial funding was provided by a legacy from the poet Kathleen Herbert. It has remained a small organisation, with the artist’s surviving family providing and maintaining its premises. At such time as this family support ceases, if not before, the RMS Trust’s Archive should be transferred to a permanently secure and accessible location. To date, all the Trust’s work has been achieved without recourse to public funding. Sales of work (allocated by the Charity Commission to be held separately for this purpose) combined with generous private donations and by voluntary work, have funded all the Trust’s exhibitions, publications and research. With its obligations clearly in mind, the Trust is now planning solutions in the form of a comprehensive database and a bequest structure to fund the placing of its Archive. The RMS Trust's primary obligations are "to preserve and make known the paintings and drawings of Ralph Maynard Smith". In the last decade the Trust has made steady progress with its objectives. Particular thanks are due to Wolseley Fine Arts and to two trustees, who have maintained the smooth running of the Trust from its inception, while four others have contributed as specialist advisers. We are also grateful to a number of professional 'friends' of the RMS Trust for their financial support, time and expertise. The Trust is now planning ahead, as the premises and services on which it presently relies can no longer be guaranteed. Similarly as regards storage, which although handled quite separately is equally under threat, and like the RMS Trust's premises themselves can no longer be relied on as a secure resource. 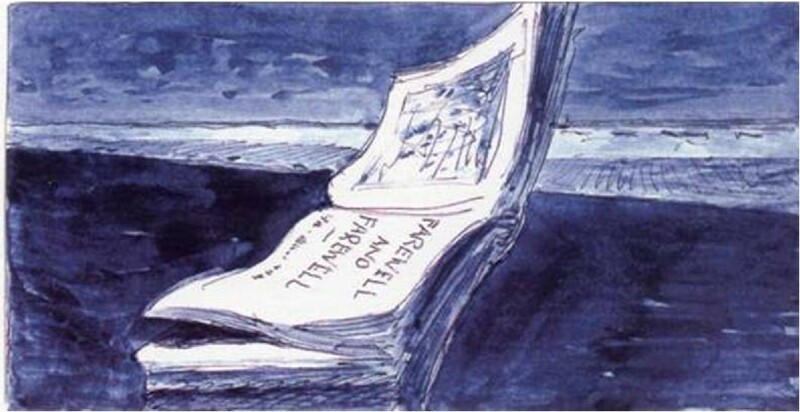 The development of the Archive and Database described on this Website has been part of a long-term strategy to ensure the continued care of and access to Maynard Smith’s work. This Archive will be offered as a gift to an appropriate Arts Institute or University. Mechanisms are being explored whereby the gift of the Archive would be accompanied by a financial bequest, benefitting the host institution(s). Together with the Archive, this would form “The RMS Bequest”. As regards the RMS Trust Bequest: because it would be funded by a testamentary provision of income, that provision will not be available to support extension of the database to include Writings and Architecture, which as a result progresses slowly. 3. “Path Intimate (at my threshold) Not Remote, Not Distant”. 1942. Pen & ink and pencil on toned paper. 4 x 6 inches. K605.00. From the Raw Material sketchbook. The database records not only all the oil paintings, watercolours and drawings, but also the so-called sketches, which together form the complete oeuvre of the artist RMS. The RMS Trust has donated one such ‘sketch’ to the Tate Archive at Millbank, as recorded in the database entry reproduced above. 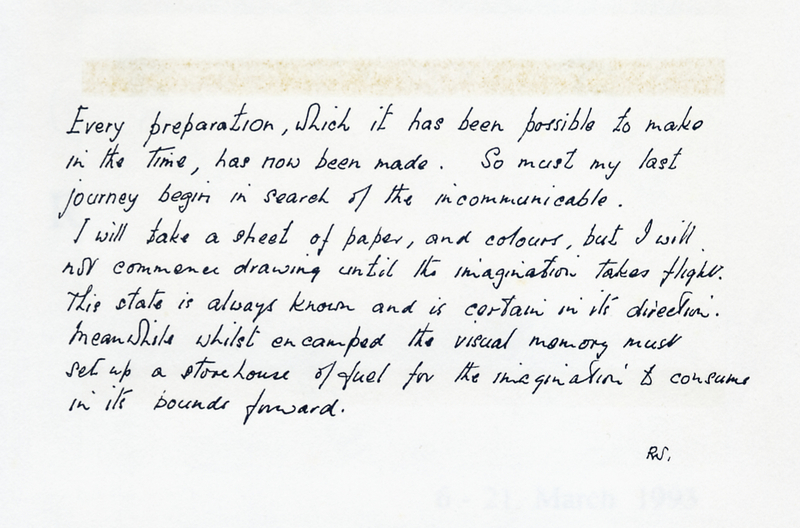 This shows how RMS’s ideas would often first materialise of an evening, after returning home from London, when the easiest source of paper was to be found by reaching for the nearest book, and drawing on one of the blank end-pages. An important function of the database is to facilitate comparative viewing of RMS’s paintings, writings and architecture. 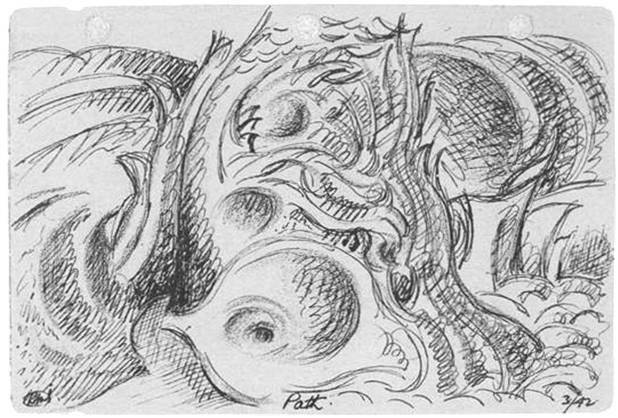 An example (see '3' above, "Path Intimate") shows how, using the database records it is possible to trace the growth of a generic idea from a sketchbook, which in some cases leads to many other works. This particular drawing is mentioned by Roger Cardinal on the “Archive (Drawings & Paintings)“ page. The three examples below show a comparison of work in the three different disciplines, completed contemporaneously soon after the Second World War. A further function of the database will be to provide the foundations for an illustrated on-line catalogue raisonné. See “Work in Progress” for an explanation. The overall task ahead is to include also all RMS’s writings and architecture as three sections within the one database. 5.25”. W: un-numbered. 6. Design for proposed London Chest Hospital. 1947. Carbon pencil on paper. Size of original not known. A: un-numbered. 1. “THE RMS COLLECTION”: this term describes the original collection, which was slowly assembled after the artist’s death. Because he did not exhibit or sell his work, it was an unusually comprehensive collection, with only a very few works ‘missing’, such as one or two gifts to relatives or close friends. If those few known gifts are included, “The RMS Collection” represents the complete known oeuvre of RMS. The term “RMS Collection” includes the ancillary sections of Writings and Architecture. 2. “THE RMS ARCHIVE COLLECTION” on the other hand is considerably smaller. It consists of one main and two ancillary parts. The term describes the work (and the documentation thereof) being put aside specifically for the purpose of establishing an authoritative Archive. 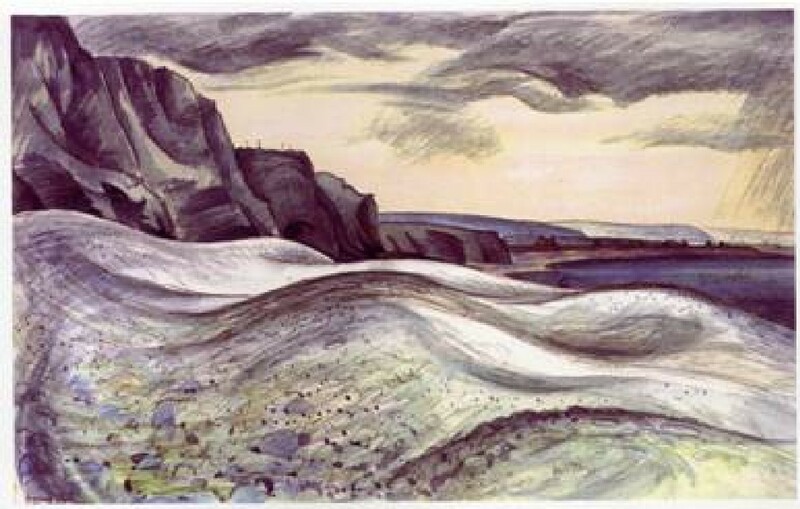 As a certain number of works were allocated for the artist’s son’s collection (as agreed by the Charity Commission), and another group of work will be retained by the Trust for ongoing exhibitions, it will be seen why the “RMS Archive Collection” is smaller than the original “RMS Collection”. In addition, a significant number of works have been sold to both public and private collections in recent years, from the associated holding collection approved by the Charity Commission. Furthermore, the exact list of contents of the “RMS Archive Collection” will be open for discussion with any prospective host institution. 3. “THE RMS TRUST DATABASE”. 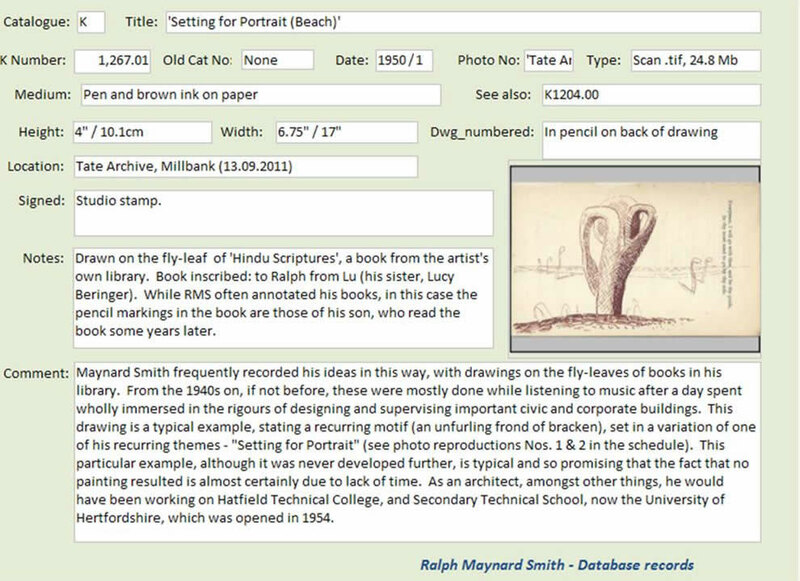 The primary objective of this database is to record the complete oeuvre of Ralph Maynard Smith (that is “The RMS Collection”), so that wherever individual works are dispersed, and wherever the archive is (or, if necessary, the partitioned ancillary archives are) kept, an overview of this unusual, multi-disciplinary life’s work will be accessible to the public. For details and progress, see the appropriate pages of this website. To recapitulate: looking at “The RMS Archive Collection” as a whole, it is seen to comprise one main and two subsidiary parts. These mirror the artist’s complicated, multi-disciplinary working life. The main part consists of paintings & drawings. Smaller sections cover the artist’s writings and his architecture. Ideally these three aspects of his oeuvre would be contained in a unitary archive, but, for practical reasons, it may prove necessary for them to be held by separate institutions. 7. “Farewell and Farewell”. 1960. Pen & ink & watercolour. 3.5 x 7 inches. K1605.00. RMS Trust Collection.